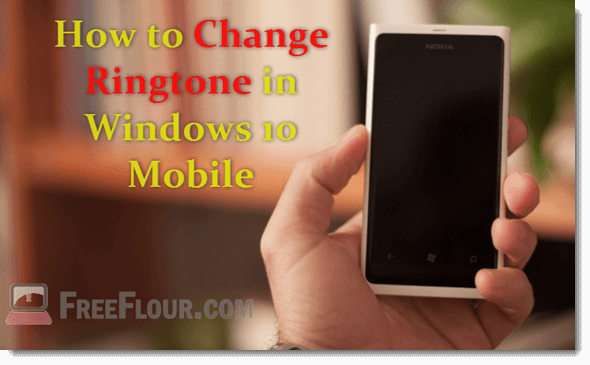 Simple guide on how to change ringtone in Windows 10 mobile by importing your favorite music or sound files from your PC to Android phone. It’s always been important we get to choose what we want to hear when we receive a call, get a message, snap a pic or do anything else that would trigger a ringtone or sound on our Windows 10 mobile phones. In this short tutorial, we will show you a simple way to easily import ringtone or any kind of sound or music file into your Windows 10 Mobile and set it as your phone’s ringtone or any event that would trigger a sound. By default, your phone would come with a number of pre-installed ringtones. If you want something more, like a music or song of your choice to be your ringtone, sms alert, or any kind of sound alert in your Windows 10 mobile, you can import the sound files directly from your Windows 10 PC onto your Windows 10 phone with the following method. To get the music or sound files from your PC into your Windows 10 mobile, first connect your device to your PC. Go to the Start button > select File Explorer > This PC. Your phone should show up under devices and drivers. Double click on your phone folder, then double-click the folder named Ringtones. Now, assuming you already have a music or sound file on your PC ready to be imported to your device (otherwise maybe go and search for our guide on how to download music or sound file from the internet). If you don’t know where your musics are stored on your PC, check on your Music folder which can be accessed from the File explorer. 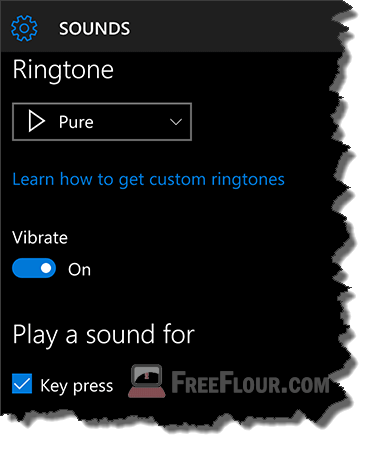 Simply drag or copy and paste your desired sound files into the Ringtones folder of your Windows 10 mobile mentioned in step 2. On your Windows 10 phone, go to Settings > Personalization > Sounds > select Ringtone to look for and select your newly imported ringtone. Have fun! It’s worth mentioning that Windows 10 mobile currently supports the music and sound file format of WAV, MP3, WMA, AMR, AAC, MP4, M4A, M4B, FLAC, 3GP and 3G2 formats. However, in some cases, some of these mentioned format won’t work in Windows 10 mobile. If you have a sound file that doesn’t get detected by your phone after importing it, try to convert it to mp3, wav or wma using a free converter which can be found anywhere on the internet and import it again. In Windows 8.1, 8 or 7, the steps are basically the same except for the path to the Ringtones folder which is slightly different from that of Windows 10. In Windows 8.1 or 8, your phone folder will be located at Desktop > File Explorer > This PC / My Computer. Whereas in Windows 7 or Vista, it should be at the Start > My Computer folder. The rest of the steps are all the same as above. Though this isn’t a popular method but it’s in fact the easiest way if you can get familiar with the app. In Windows 10, there is a built-in app called the Phone Companion App which helps you to sync files, music and other types of data between your Windows 10 mobile and PC. You can start the app by simply search for Phone Companion in the search box, open it and start using it while your Windows 10 mobile phone is connected to the PC. In Windows 8.1, 8 or 7, there is an app you can download from Microsoft site or from the metro app store called Windows Phone App for Desktop which does just the same thing to sync files across your PC and your Windows 10 mobile. Just download the app, connect your device to your PC and launch the app. This how to change ringtone in Windows 10 mobile guide is applicable to the following Windows 10 supported devices: Alcatel OneTouch Fierce XL, Pixi 3, BLU Win HD W510U LTE X150Q, Microsoft Lumia 430 – 950 XL, Lumia 1520, MCJ Madosma Q501, Xiaomi Mi4, Acer Liquid M320, M330, Freetel Katana 01, 02, Panasonic ToughPad FZ-F1, Acer Jade Primo, HP Elite X3, VAIO Phone Biz, Yamada Denki EveryPhone and UMI DIGI.